They say if March enters like a lion it will leave like a lamb but what if it enters as a delicious piece of deep fried chicken? 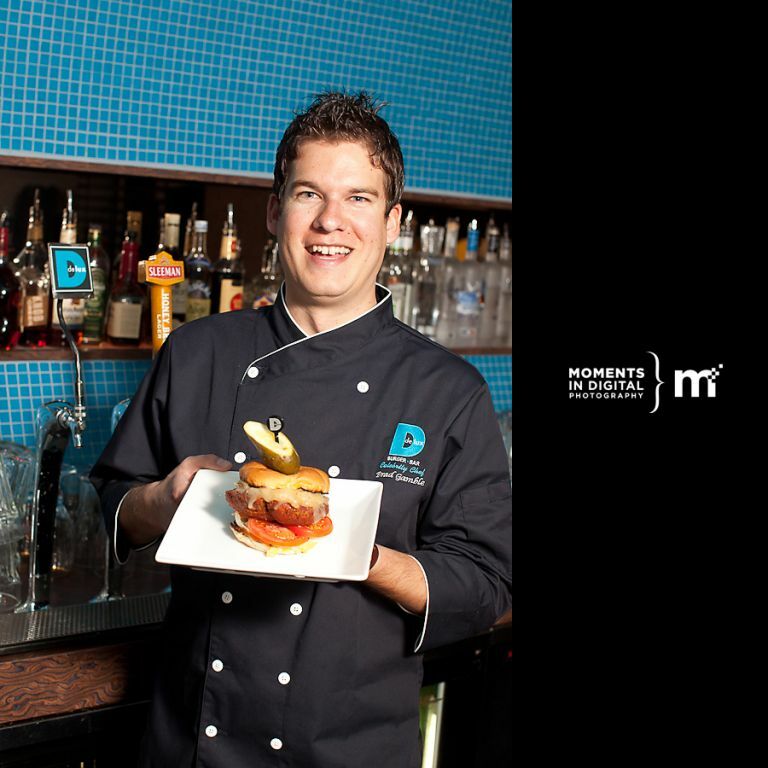 It’s the start of a new month and that means another new Delux Burger Celebrity Chef! 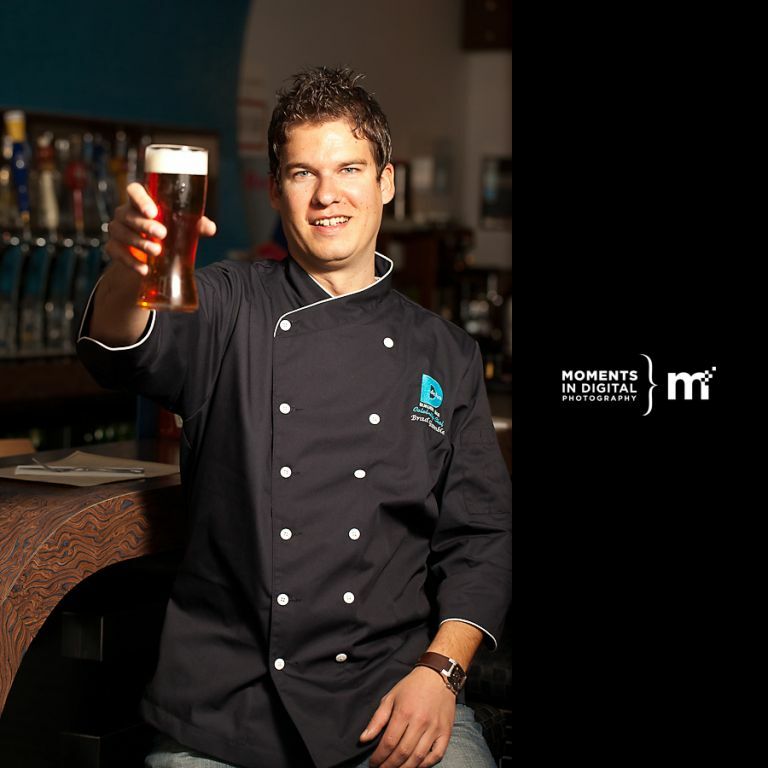 This month’s Celebrity Chef is Brad Gamble who is the on-site sales representative for Sleeman’s Brewery. 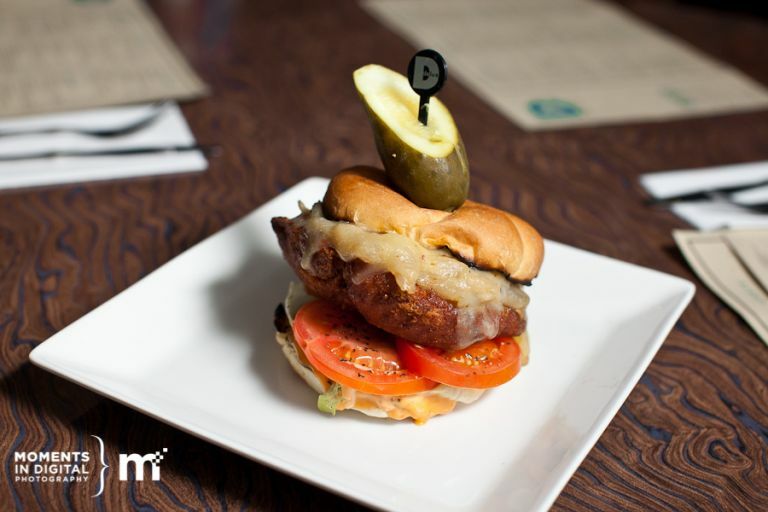 Brad’s burger is called the ‘Gambler’ and features a honey glazed chicken breast, deep fried in a cajun batter, topped with jalepeno javarti and onions which have been grilled in Sleeman’s Honey Brown ale. Throw in a a nice ripe tomato and lettuce on a fresh bun and you’ve got a burger that will have Col. Sanders running for the hills. 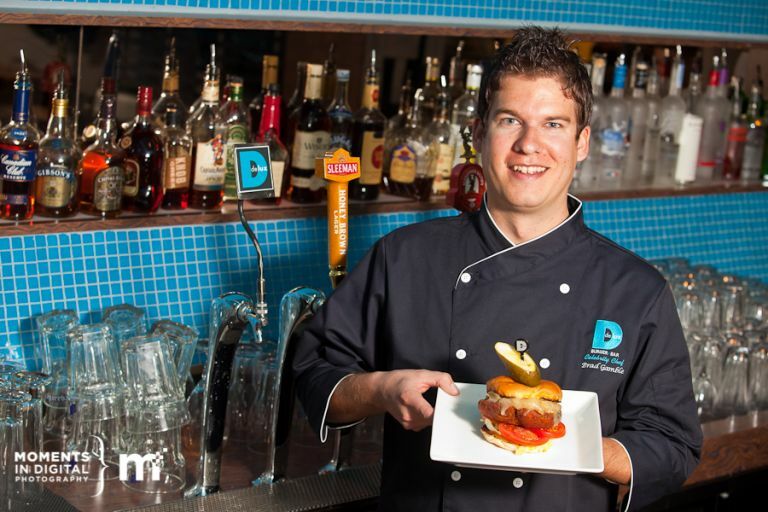 Be sure to drop into either location of Delux Burger to try out Brad’s burger throughout the month of March. Since Brad represents Sleemans, for this shoot I thought it would be great if we could find a way to incorporate the beer taps from the bar at Delux. After we rearranged things behind the bar a bit we were able to find a great spot to shoot in and use some of the late afternoon natural window light. I added in a 580EX IIÂ just to Brad’s left for a little additional fill and triggered them using the PocketWizard miniTT1 and TT5 devices. Here are some of the photographs from our commercial shoot at the Crestwood location. Brad will have to work hard if he’s going to beat the new sales record which was set last month by Nicola Crosbie of Global TV. In just one month, 2074 Nicola Burgers were sold which more than tripled the previous record. In doing so, Nicola helped to raise close to $2100 for the Edmonton Eskimo Woman’s Ovarian Cancer Research Endowment Fund. Check out the article on her accomplishment which was featured along with my photography in the Edmonton Journal.Â Missed any of the previous Delux Burger Celebrity Chefs? You can check out photos by visiting my previous blog posts.